I visited the North Burial Ground in Providence this week for the first time. 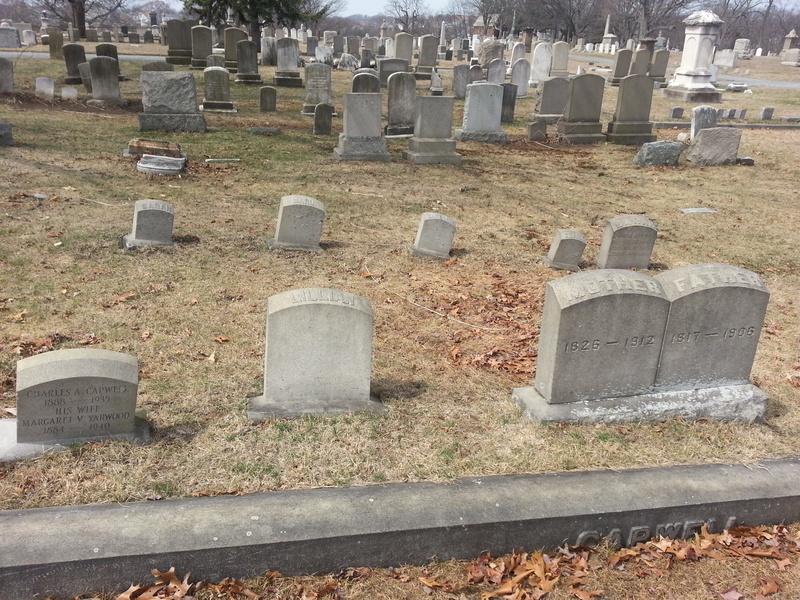 This large municipal cemetery holds over 35,000 markers (1) and over 100,000 interments (4). It was begun by the city in 1700 and remains active today, with new burials occurring regularly. 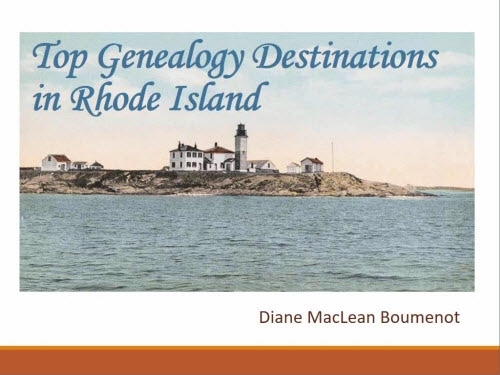 It was originally positioned north of the Providence settlement, but over the centuries Providence and Pawtucket grew around it and it is now located at the intersections of North Main Street and Branch Avenue, with I-95 running along one side. 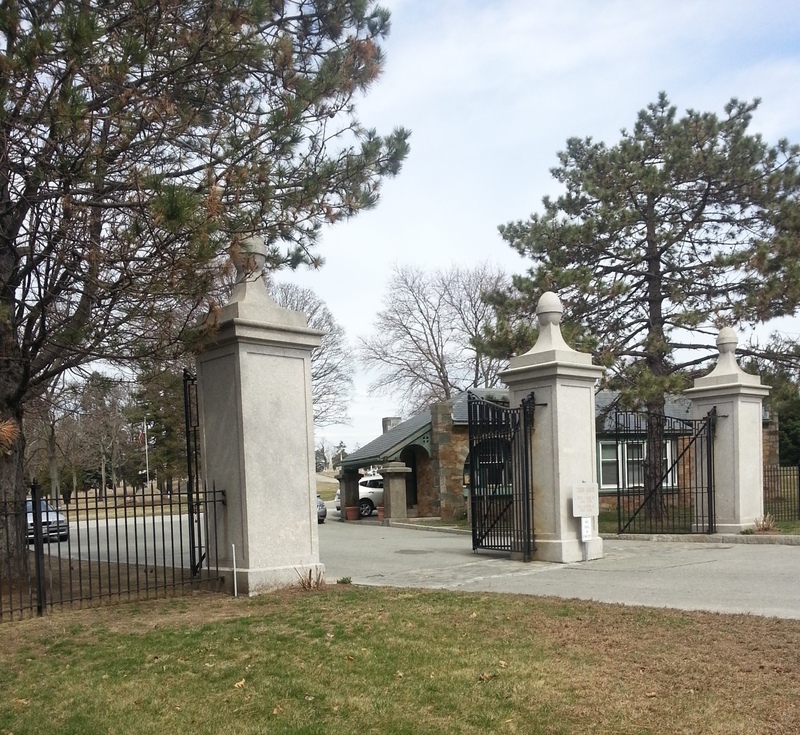 The southern entrance with the cemetery office just inside the gates. 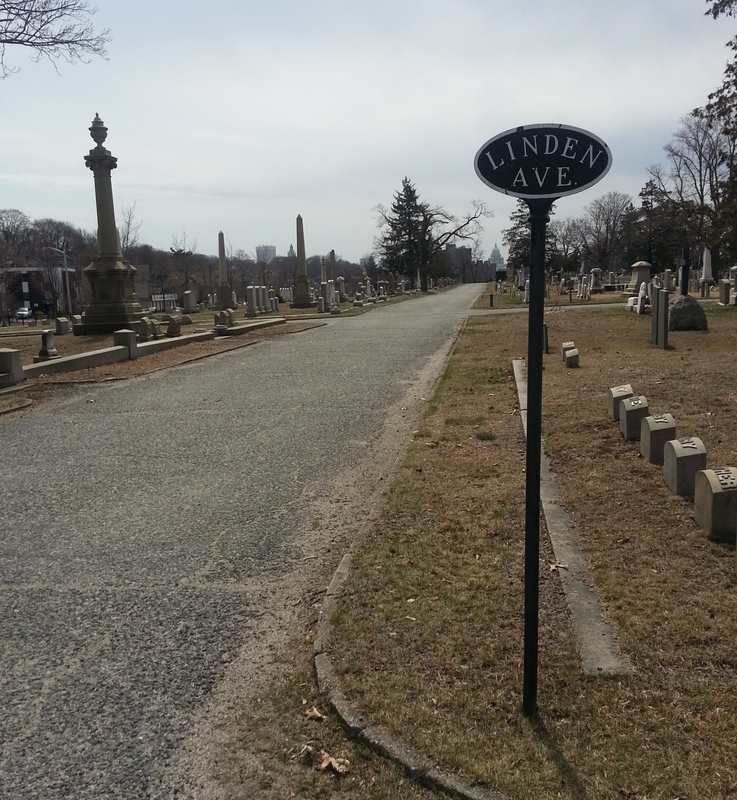 Prior to the creation of the cemetery, and during its early years, residents of Providence buried their loved ones in family plots on their own property, since there was no central church and accompanying graveyard. Gradually, many of those small cemeteries were relocated to the North Burial Ground (4). By the mid-1800’s there was a desire to make the appearance more rustic and scenic, and extensive landscaping and improvements were undertaken (4). In the 20th century the cemetery continued to grow but struggled with some deterioration and vandalism. 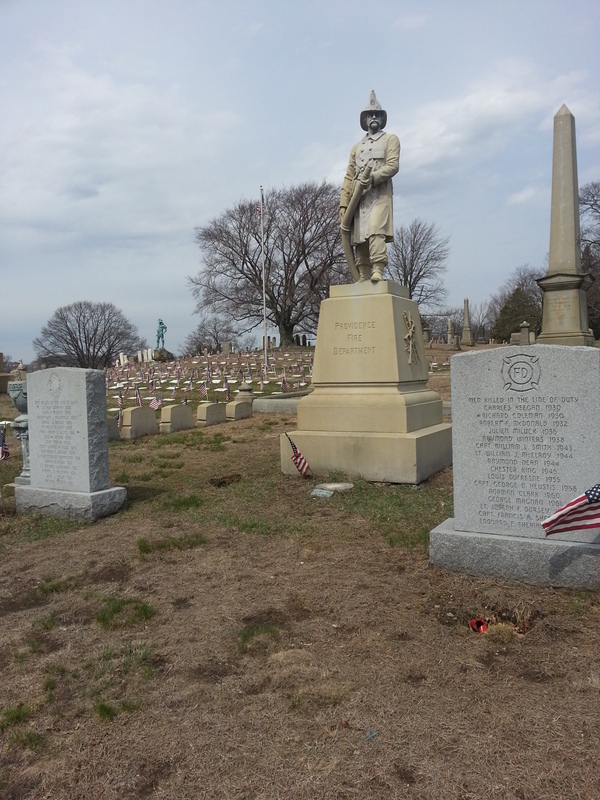 Today, the cemetery remains a unique and authentic memorial to Providence, past and present. The downtown Providence skyline, barely visible on the horizon from the center of the cemetery, gives an exaggerated idea of the distance. 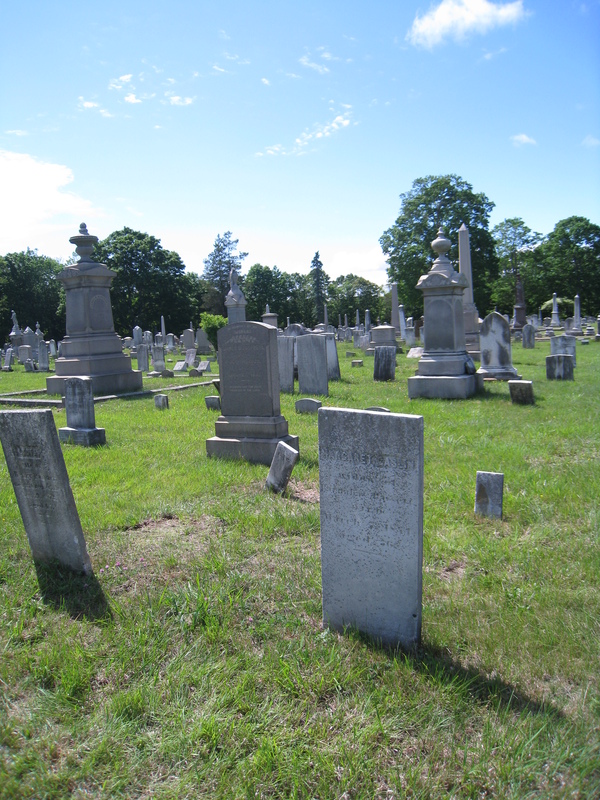 Those who frequent Rhode Island’s many historic cemeteries will appreciate being able to walk into a cemetery office and get some help finding a grave – a rare opportunity in Rhode Island. 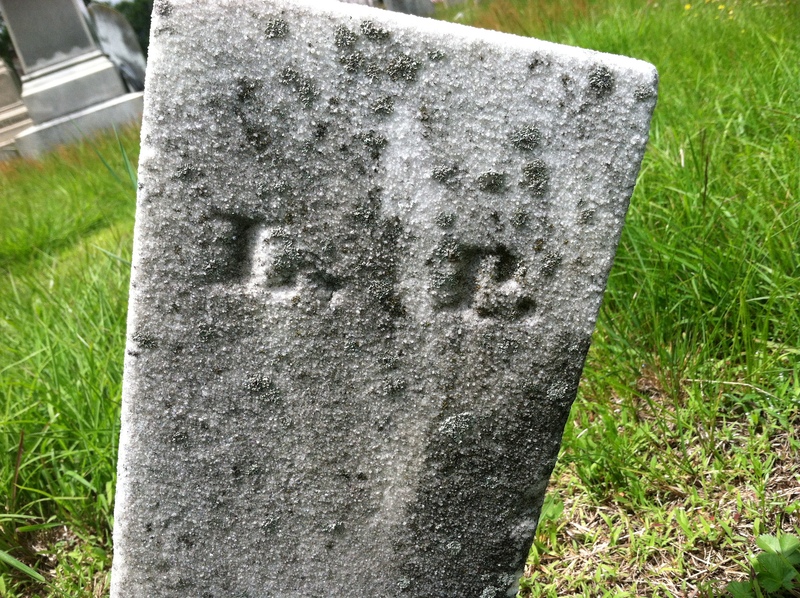 While it is likely that I have some early ancestors there, I only knew about one grave for sure that I was seeking. 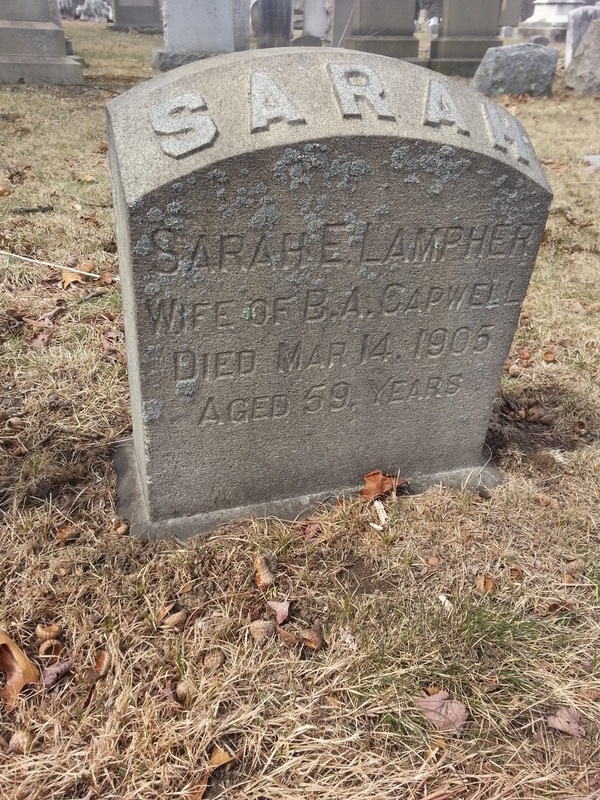 It was the grave of my great-great aunt, Sarah E. Lamphere Capwell (1843-1905). 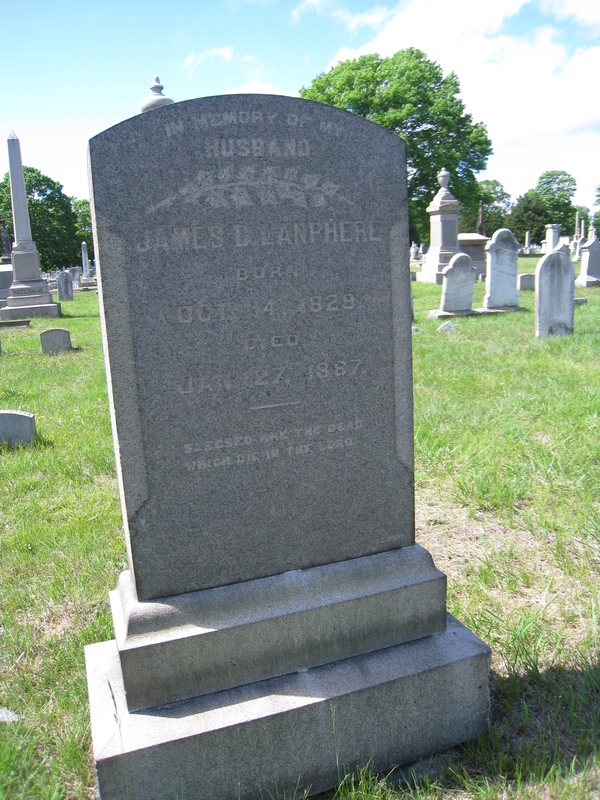 She was the sister of my gg-grandmother, Emma Lamphere Darling. 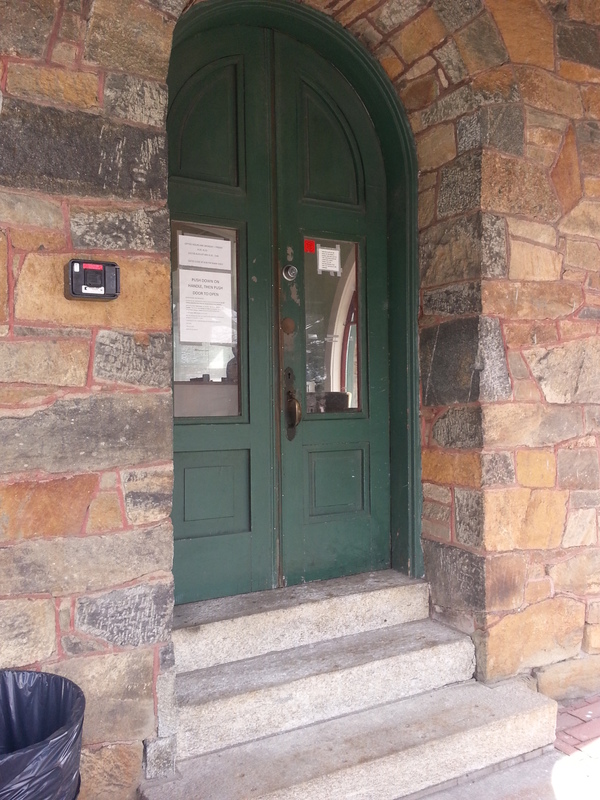 I walked into the office (open hours are listed here) with some information in hand that I had found on The Rhode Island Historical Cemeteries Transcription Project website (7) about Sarah’s burial. The staff in the office were patient and cheerful as I stumbled around a little checking the year of burial; it turns out that date is the crucial starting point. I did know the section (section BE), but they wanted to find the plot record and let me see that. The book containing the ownership and burials for the plot I was seeking. The record book was extremely helpful. It showed the layout for the 10 graves in the plot, and gave some information for each one. The Capwell plot in Section 17, Lot no. 2563. On the map, the section is called BE. 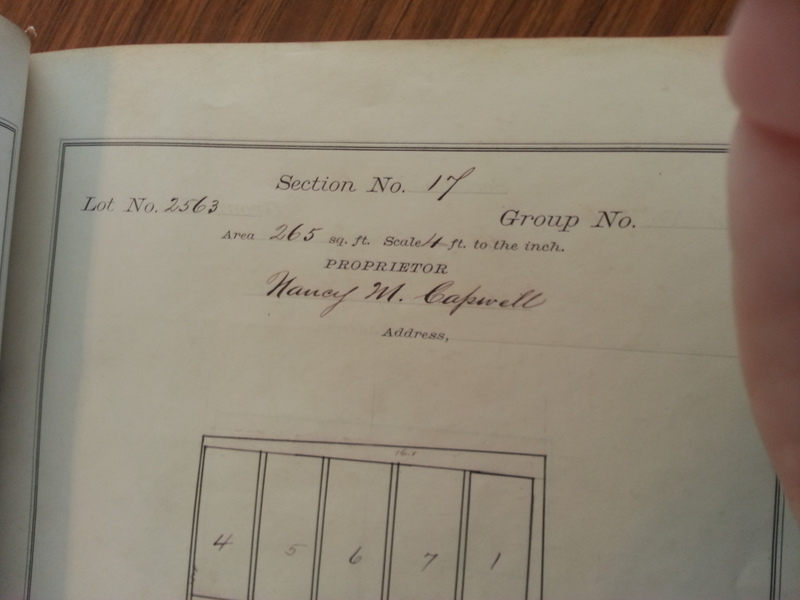 The “Proprietor” was Nancy M. Capwell. Sarah appears to be the first buried, in grave #1. 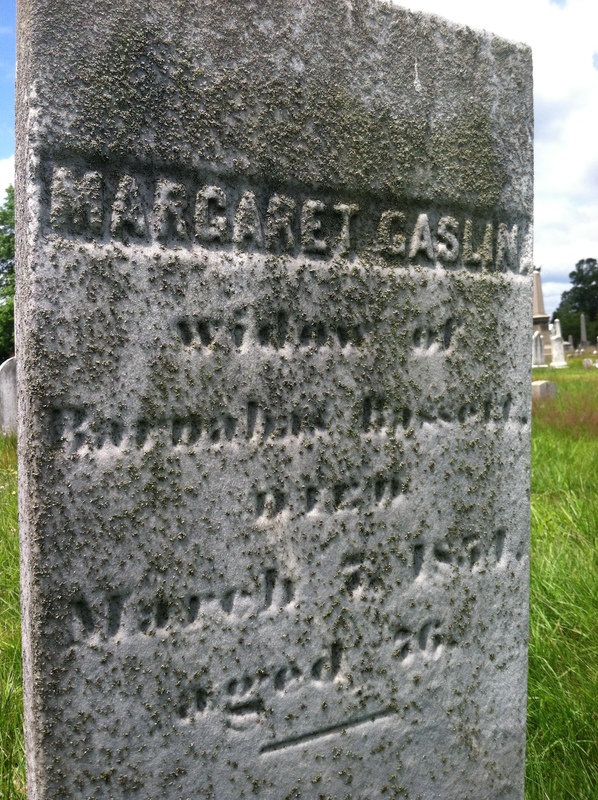 Sarah was married to Burrington Anthony Capwell, who was the son of Nancy Maria (Wesson) Capwell and Joseph Alexander Capwell (a butcher), who were buried next in #2 and #3. In the 1900 census Nancy Maria reported that she was the mother of 10 children, 4 living, so possibly the five names recorded in the plot record could have been for their children. The staff explained to me that the scanty records of those names – Sarah, Maria, Caroline, Clark and Lillian – could indicate that they were re-interred from another location. The last three names – Burrington himself, Sarah’s son Charles, and Charles’ wife, Margaret, complete the plot record. Since Margaret was actually #11, she apparently shares a grave with her husband. All interments for the Capwell plot. The list of names included ages and dates of burial for some of the interred. The staff pointed out several helpful pieces of information on the sheet. 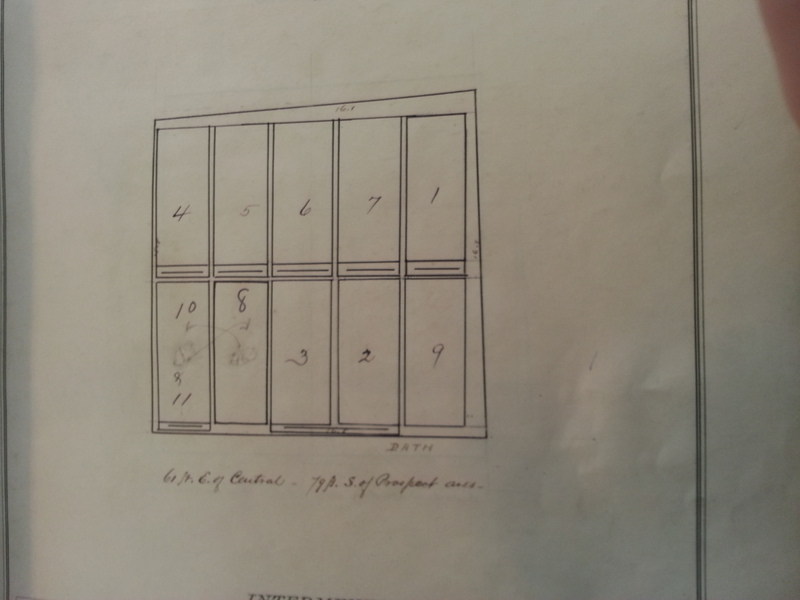 Names are listed and numbered, and the diagram of the plot shows the appropriate number in each spot. So you know where each person was buried. The rectangles and lines drawn at the foot of some graves usually represent markers. Underneath the chart is an indication of the location of the plot within the section, indicated by feet from from the nearest roads – “61 ft E of Central — 79 ft S of Prospect area”. Staff were ready to accompany me but I was willing to drive over and try to find the grave myself. 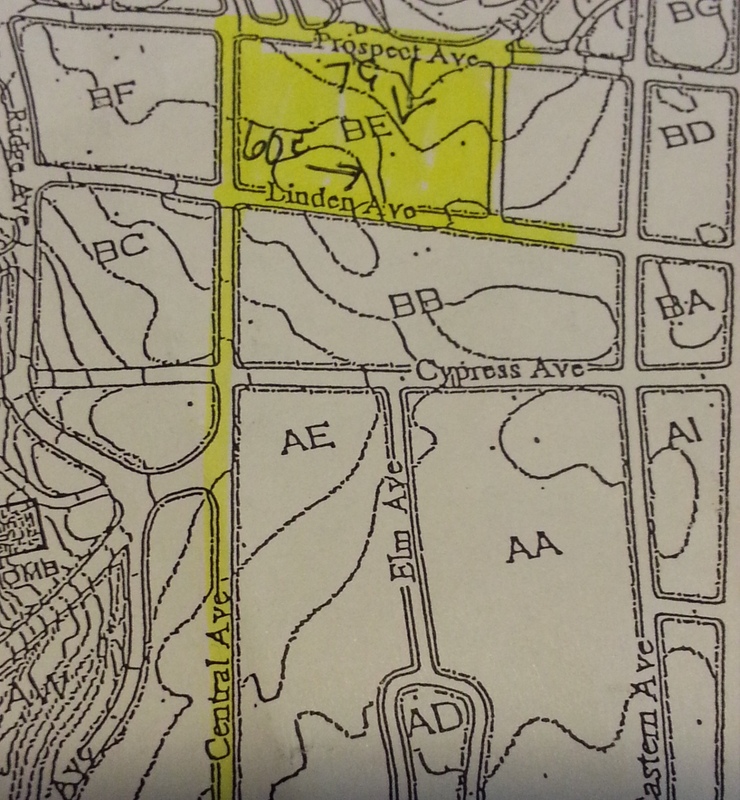 They gave me a map, and highlighted it with my route. Section BE was large. If it weren’t for the specific notations on the page I think I would have had a big problem finding it. But I counted out the feet and found the spot. A tiny portion of my map. You can see where staff pointed out the number of feet from each street. The map is not online, it is pretty much expected that you will go to the cemetery during open hours Monday through Friday and get specific directions, or be escorted, to the plot you are looking for in the huge cemetery. Staff are busy, of course, but good at getting visitors the information they need. 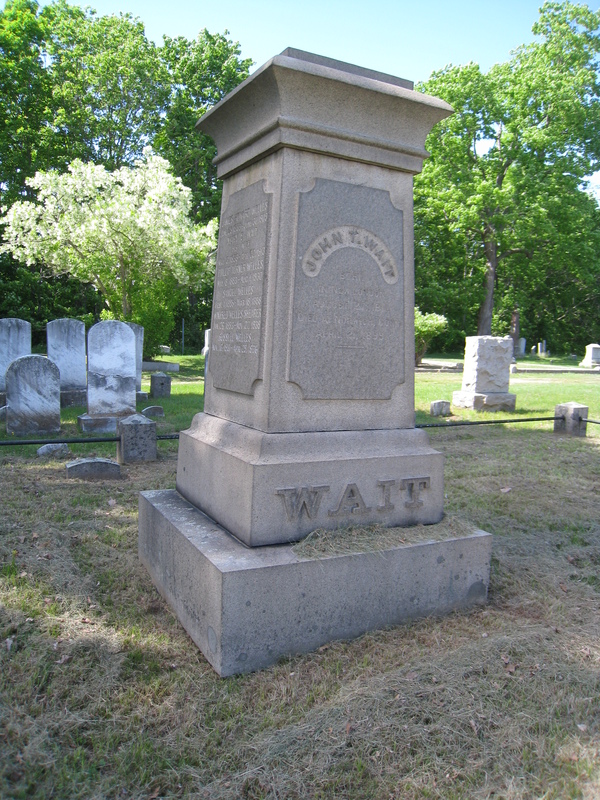 I found Sarah’s grave among the Capwells. The plot map and seeing these graves “put to rest” any idea I might have had of finding connections to Sarah’s Lamphere family, for instance, a sibling buried near her. The ten graves. Sarah is in the second row, at the end. Her husband Burrington should be immediately in front of her, but he has no marker. 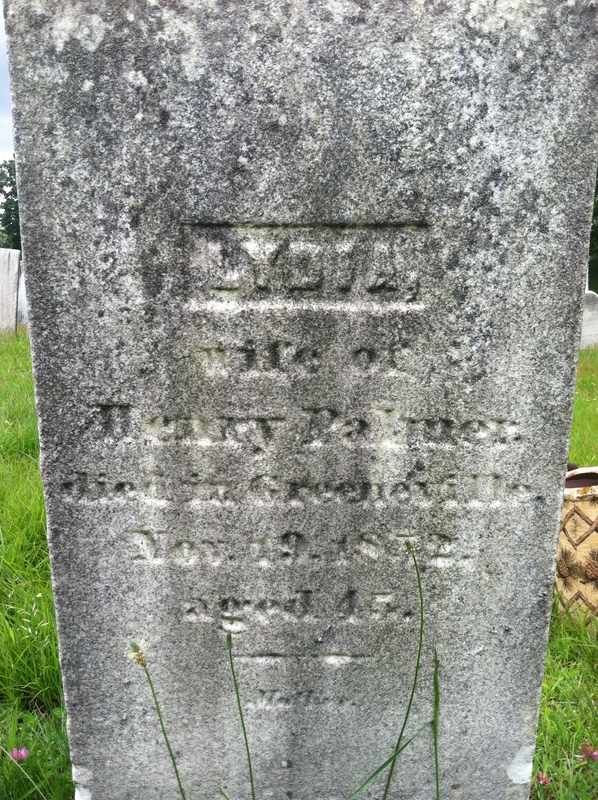 His parents have a double marker which says “Mother” and “Father” with dates, but no names at all. It wasn’t until I got home that I realized the short railing (in front) said “Capwell” at ground level. 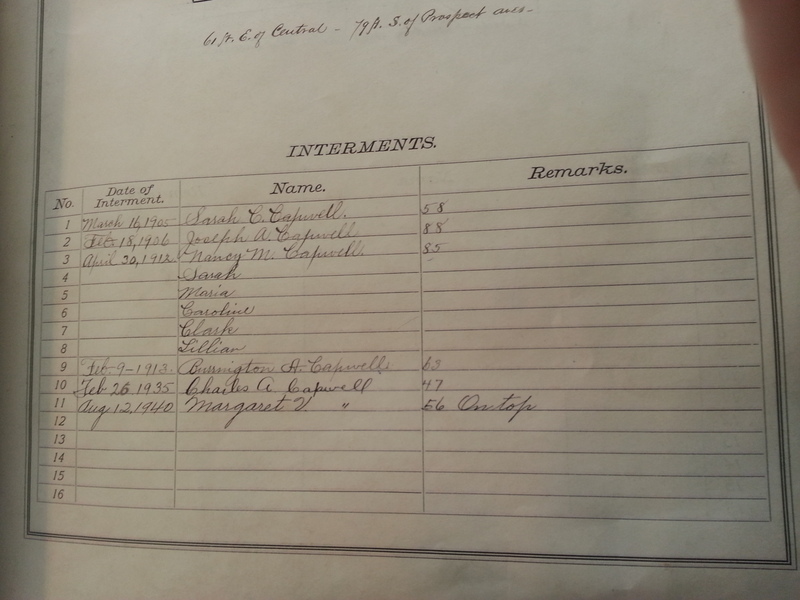 The record books in the cemetery office apparently go back to about 1848 (3). To find earlier information, most people consult John E. Sterling’s North Burial Ground, Providence, Rhode Island : Old Section, 1700-1848 (9). 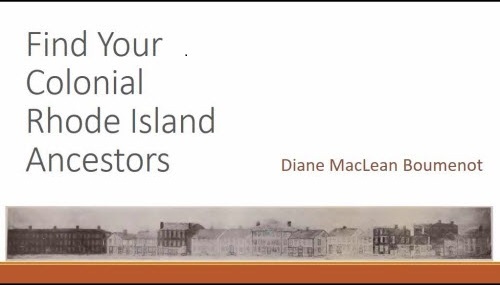 That book is out of print, so the people at Gaspee Virtual Archives (3) have provided some information about where to find a copy. There is, of course, a copy available in the cemetery office. A Firefighters memorial to “Men Killed in the Line of Duty”, beginning in 1828. 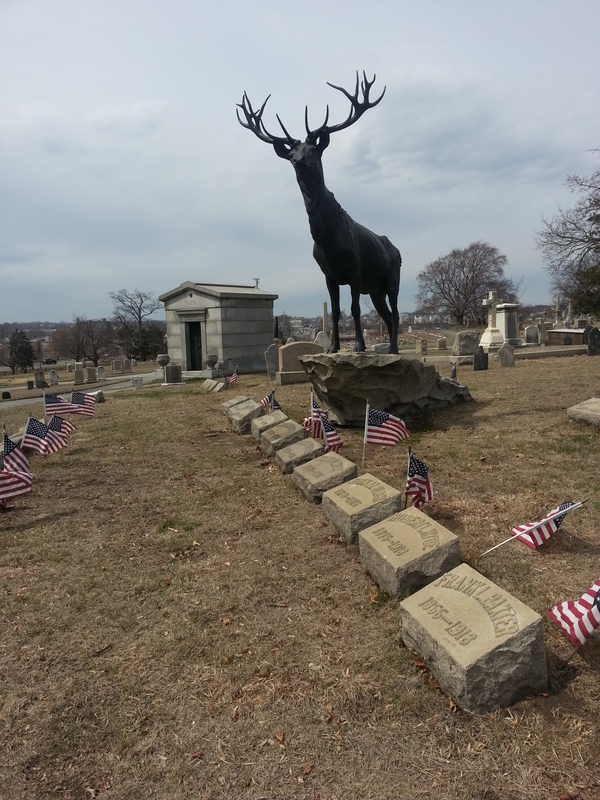 The cemetery is filled with interesting memorials added over the years – a Firefighters memorial, an Elks section, various veterans memorials, to name just a few. I’m sure I will be revisiting this huge cemetery in the future, since I suspect I have ancestors among the oldest burials. Two volumes of North Burial Ground notes (mostly legacies), from the Early Records of the Town of Providence: volume 18 and volume 19. 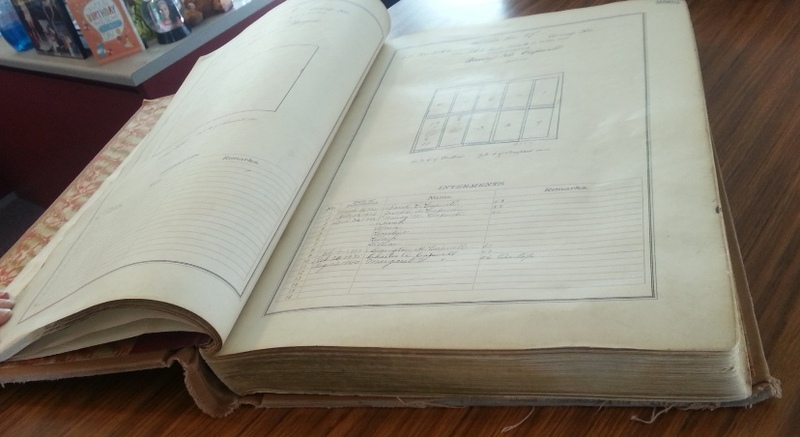 Some old inscriptions are recorded in The Narragansett Historical Register with the title ” The Story of the Tablets” by James L. Sherman See volume 4 (p. 70, 116, 178, 283) and volume 5 p. (67, 166, 268). Find links to all volumes here. 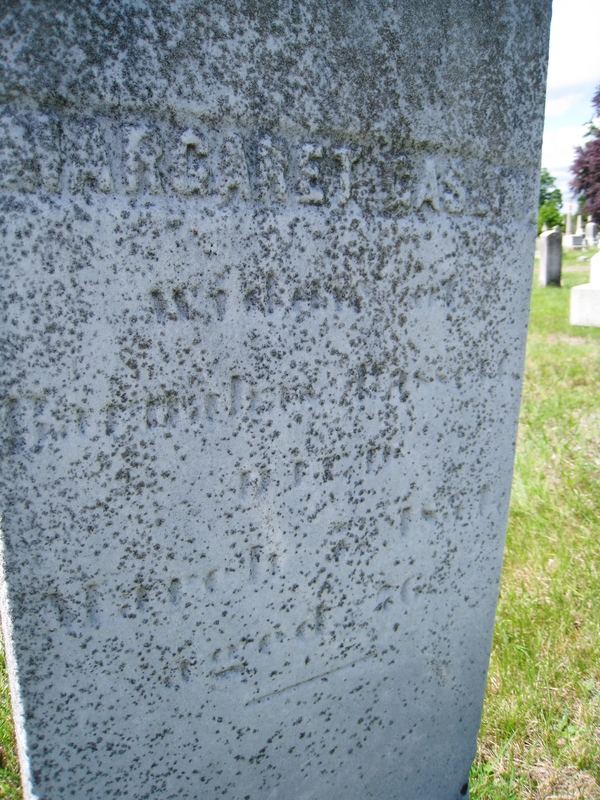 The Rhode Island Historical Cemeteries Transcription Project. This large index can be downloaded in small pdf sections. It includes entries statewide. 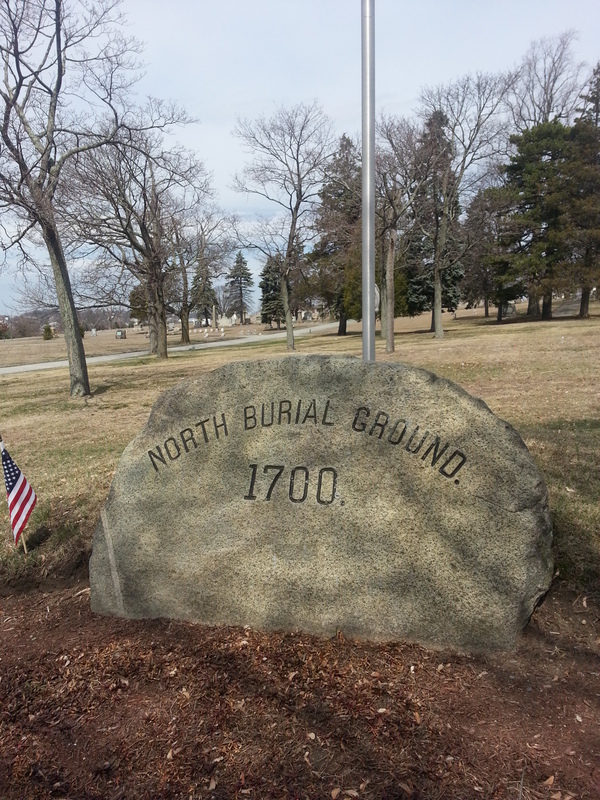 FindAGrave section for the North Burial Ground. North Burial Ground, Providence, Rhode Island : Old Section, 1700-1848 by John E Sterling. 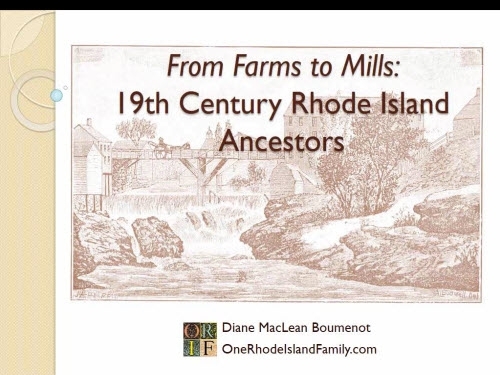 Greenville, RI : Rhode Island Genealogical Society, 2000. This book is out of print. See the WorldCat record here, and another list of repositories that hold the book here.